Reviewed: We test the Samsung Series 7 Chronos 700Z laptop - offering a 15.6" screen, 8GB RAM, 1TB HDD and Intel Core i5 3210M processor, all packaged in a stunning design and running on Windows 7. Below is our review of the Samsung Series 7 Chronos 700Z, a 15.6" laptop, featuring 8GB RAM, 1TB hard drive and Windows 7 Home Premium 64-Bit. The first thing you noticed about the Samsung Series 7 Chronos 700Z is the thought that has gone into both the design and construction. It looks desirable, sleek, minimalist and stylish - with a expensive finish to both the outer casing and the inside of the laptop. Apple have long been renowned for creating aesthetically pleasing products, and now the PC and laptop market are finally catching up. Manufacturers are now seemingly putting more effort into the design of their products, in addition to technological advances. 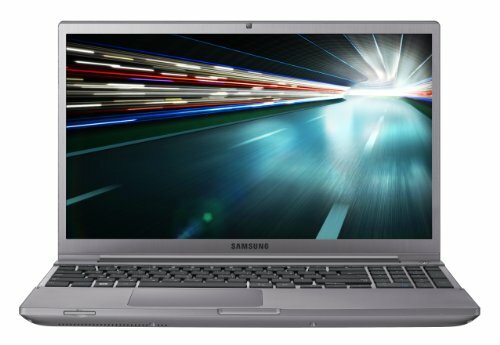 The Chronos 700Z by Samsung is a good example of this - granted, it is a higher end laptop but it does have a more expensive and attractive look and design than a similar priced laptop of years gone by. The metal exterior has a stunning finish, with the added bonus of it not showing any finger print marks, and as such should maintain it's looks without requiring regular dusting. The underside of the laptop is made out of plastic, as is the actual body - however it feels durable, solid and does not detract from the overall expensive look of this notebook - from whichever angle you look, it oozes quality. It isn't an ultrabook, and as such at around 24mm thick, it isn't aiming to be the slimmest and lightest laptop out there - however what it does provide is a high specification which makes this notebook both functional and highly portable, with it's weight at a relatively low 2.3kg. So asides from the beautiful "Apple-like" design, how does it actually perform? As you can see from the technical specifications above, it features a clear 15.6" display, which is somehow squeezed into the relatively small body of this notebook, with a thin bezel surrounding it. The 700z's measurements are 36.2cm by 23.9cm, with a depth of around 2.4cm. The screen resolution is 1600 x 900 pixels, which is beautifully crisp on this 15.6" anti glare display, making it suitable for those who wish to work in brightly lit environments. It is all easily adjustable in terms of brightness, contrast and colours - so you can tailor it as required. the auto facility can be activated so that it automatically adjust the screen to suit whatever media you are viewing - can come in handy in our experience. The adjustable backlit keyboard of the Samsung 700z is very slightly sunk into the body - this stops the keys from touching and damaging the screen upon closing the laptop - helps reduce the risk of breakage. It spans the full width of the body of the notebook, with a full numberpad being fitted to the right hand side of the keys - this doesn't drastically decrease the size of each individual letter key - these are still a practical size, and are comfortable to type on. The downside of the numerical pad on the right is the fact that this pushes the rest of keys to the left - meaning that these are no longer located in line with the centre of the screen - so if you plan on using this laptop for regular typing it may feel odd at first, as your hands will predominantly be situated off centre and to the left of the screen. However if you regularly use Excel or other software which requires regular numerical input, you may welcome this handy number keypad. The actual keys have good spacing between them, meaning it should be easy to clean this laptop from dust. The wrist rest felt comfortable and spacious - making this machine suitable for regular use without discomfort. Several function keys running along the top of the keyboard enable you to easily adjust settings such as brightness, as is standard for the Chronos range. The icons used on these are unusually clear - there's no need to consult the manual or guess before pressing. The trackpad is pretty generously sized, and offers multi-touch control, which we found to be both accurate and easy to use. If this laptop is your primary computer however, we'd recommend buying a mouse to use - we can't find fault with this trackpad in particular, however browsing via mouse in our experience will always be both faster and easier in the long run. The built in trackpad is fine for shorter use though, and is up there with the best in terms of usage and finish that we've come across. So what's inside? Powered by the speedy Intel Core i5 3210M 2.5GHz processor, and offering 8GB of DDR3 RAM, as well as an integrated Intel HD Graphics 4000 graphics card, this laptop is speedy. As with most laptops in this price range, it runs on the Windows 7 Edition Home Premium operating system. The hard drive is a massive 1 TB, which will provide more than enough storage for most users. It features a SD card reader on the side, as well as a DVD drive, which is nicely sunk into the right hand side of this notebook. Other connectivity includes 3 USB sockets, Ethernet and an HDMI port. The Ethernet socket automatically expands when in use, and contracts when not being used, in order to fit in with the slim profile of this laptop. A headphone 3.5mm jack is also included as standard. Another handy feature is the Samsung ExpressCache, which is essentially an 8GB solid state drive which provides a boost for key processes, such as regularly used programs and the operating system - this helps speed up start up time, which was around 30 seconds by our testing. All in all, it runs very fast for a laptop - and is suitable for both work and play - HD movies play smoothly with no jerks or skipped frames - the layout of the controls make it practical - working on this machine doesn't feel like a chore or a compromise. Graphically the laptop can handle most games, although you may prefer to boost performance by turning down the settings a little - this is no way a criticism though, as this laptop isn't designed with this specifically in mind. Battery life is good - the manufacturer claims 5420 milliamp hours - however as this is built in, you can't buy an additional backup battery to carry around with you - as with most laptops in this price range, you can run this notebook in various eco settings to try and conserve power. Pros: Looks stunning, reasonable price tag, high spec and ExpressCache means it runs very fast for a laptop. Cons: Can't easily fit a spare battery - asides from that we can't fault it. Overall the Samsung 700z looks stunning, and performs amazingly well for the price tag. The screen is clear, and the controls are comfortable to use. The only minor quibbles are the inbuilt battery not being easily replaced, and the fact that it looks more expensive than many of it's similarly priced rivals may mean it's more appealing to thieves.